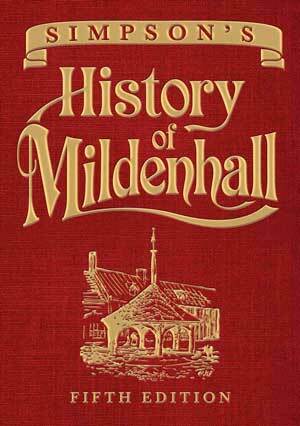 IN 1892 Alfred E Simpson, a printer based in Mill Street, Mildenhall, compiled his History of Mildenhall and its Celebrities of the Past. He published further editions of the book in 1893 and 1901, with the fourth edition appearing some 23 years after the first, in 1915. To mark the 600th anniversary of Mildenhall’s Market Charter, Mildenhall Museum decided to produce the 5th edition of this memorable work of scholarship. The bulk of the text of this edition is taken, word for word, from Simpson’s 4th edition, with all its archaic language and its idiosyncrasies, and its very personal view of the town and its history. Where the text needs to be explained or brought up to date, this has been done in the form of footnotes so as not to break up the flow of Simpson’s elegant prose. Additional material written for this edition brings the story up to date, including significant events that have occurred since the fourth edition was published. We have also included biographies of notable residents who were too contemporaneous with Simpson to warrant an entry—including Simpson himself. You can purchase the book from the Museum shop.